A Now & Then Challenge! Yes, YOU can help us solve a mystery, and be featured in Paul’s column as a Now & Then Maven! 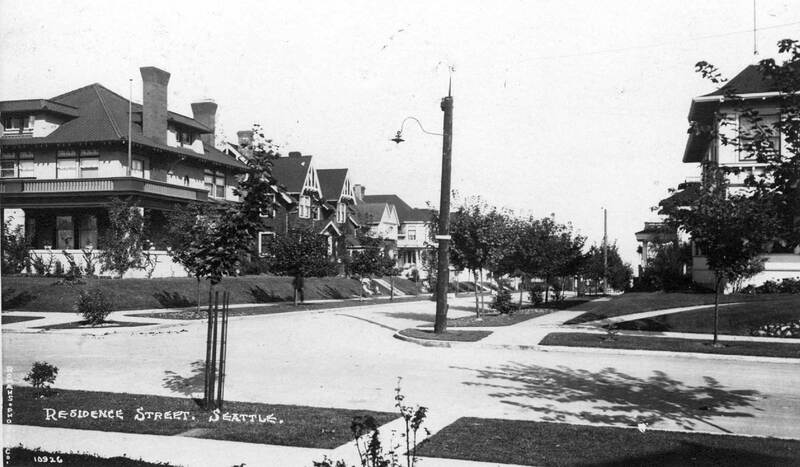 The photo below was taken, Paul guesses, of a Capitol Hill street probably to the east and south of Volunteer Park. He suggests any search begin on 16th & 17th Avenues. If you think you know the spot, drop Jean a line and he’ll come out and snap the repeat with you in the picture. It’s looking east on E Roy St from 14th Ave E. The big house on the left has been remodeled somewhat, but the other homes on that side of the street are still in play. Go here, and “walk” down Roy, and you can verify this. After the house on the corner, you’ll come across the home with the double gables, and right after that is the one with the two gables close together. You can see them better in this shot. Wow! Only a few short hours after posting this challenge, we have a winner. Alan Stein, historylink supremo, has nailed it. Alan may schedule a time of his choosing to meet Jean at 14th Ave E and E Roy for a photo op. Thanks, Alan!